Not a single measure has made it to the governor’s desk despite a steady drumbeat from his office urging lawmakers to go "20 for 20." A "bathroom bill" is on life support, but a property tax measure still has momentum, supporters say. Eight days away from the deadline to approve bills, the prognosis for Gov. Greg Abbott’s 20-item special session agenda is murky at best. Not a single measure has made it to the governor’s desk despite a steady drumbeat from his office urging lawmakers to go “20 for 20” since weeks before the special session began. The most high-profile item on Abbott’s list – a measure barring some transgender people from using bathrooms that match their gender identity – is on life support. House State Affairs Chairman Byron Cook, R-Corsicana, said Tuesday he will not give the “bathroom bill” a hearing in his committee — and the measure’s author, state Rep. Ron Simmons, said it would be difficult to amend the bill as written to any other legislation moving through the chamber. And while the Republican-dominated chambers have tackled several other issues, with limited time left in the session, they remain at odds on details. The Abbott agenda has a decent track record in the individual chambers — the House has passed bills related to about half of the governor’s agenda items, and the Senate has passed bills related to all except two. Both chambers have voted out their own versions of bills on topics like abortion restrictions, public education and maternal mortality, though it's unclear which chamber's bills will progress. But the Senate’s brisk pace has tilted the balance of power to the House in the remaining days of the session, where Speaker Joe Straus has never voiced support for Abbott's full list. The House's slower approach has led to frustration for some Republicans who are supportive of Abbott's special session agenda. "If we don’t get through what we need to get through, I would absolutely support another special session,” said state Rep. Matt Rinaldi, an Irving Republican who is one of 12 members of the conservative House Freedom Caucus. Among the education issues on Abbott's agenda are $1,000 raises for teachers and addressing problems with the school finance system. House and Senate leaders have made their distaste for the other chamber’s major education proposals known in colorful terms. On Tuesday, Senate education chairman Larry Taylor, R-Friendswood, held a press conference to announce he was rejecting the House's proposal to put $1.8 billion into public schools, likening it to trying to drive a broken-down car "knowing you will be facing expensive repairs and ultimately be driving it into the ground." 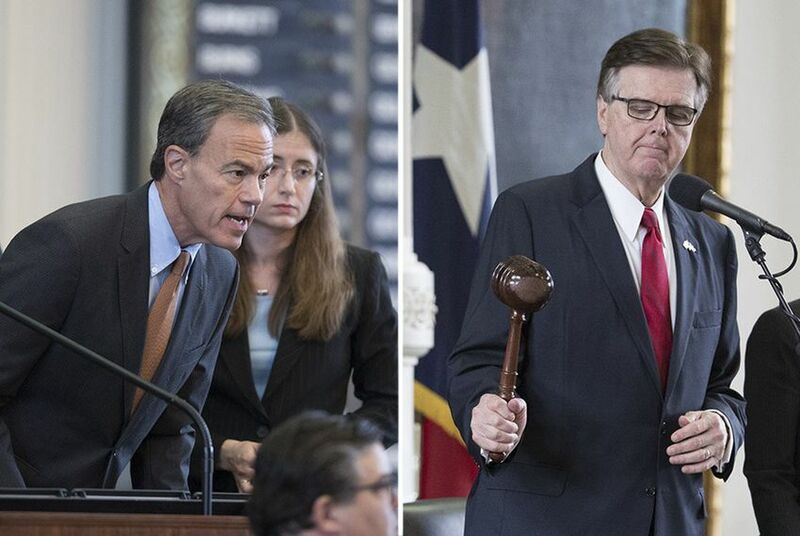 Hope remains for property tax reform, which both Abbott and Lt. Gov. Dan Patrick declared their top concern for the session, but, again, the two chambers have yet to reconcile their widely different approaches. And a mix of bills aimed at curbing local government spending and ability to regulate land use are also stalled. Two of the bills have yet to even make it out of the Senate. The prospects of another one that Abbott has personally championed – curtailing cities’ ability to regulate tree cutting on private land – are shaky. Though a Senate committee advanced a House version of the bill Tuesday, lawmakers there amended it in a way that will likely be unpalatable to House members, whose own bill replicated one Abbott vetoed during the regular session. Right now, the only pieces of legislation that appear to be on a clear path to approval in both chambers are the must-pass measures that forced Abbott to call the 30-day special session in the first place: bills to avoid shutdowns of the Texas Medical Board and a few other state agencies that became hostages in the war between House and Senate leaders during the regular session that ended in May. The House is scheduled to vote on legislation already approved by the Senate addressing that issue this Thursday. "I'm certainly not going to pre-negotiate"
Though almost all of his key priorities remain in limbo, Abbott’s team remains confident. Throughout the special session, the governor has maintained a steady pace of TV interviews aimed at every media market in the state, and that shows no signs of slowing. Conducting them from the new satellite studio at his campaign headquarters down the street from the Capitol, he also used the space to continue to crank out short videos with lawmakers who have taken the lead on his agenda items for social media. Abbott's office has been particularly encouraged by the progress on his top priority of property tax reform, noting there's been more headway on it in the past 21 days than there was during the entire regular session. When it comes to property tax reform, Senate leaders have put most of their muscle behind state Sen. Paul Bettencourt’s Senate Bill 1, which cleared the chamber in the special session's early days. It would require city and county governments to hold elections if they planned to raise property tax revenue by 4 percent or more, and it would also overhaul the property appraisal process. Patrick claims the measure would offer Texans “dramatic reductions” in their property taxes. The bill wouldn’t immediately cut property tax bills, but it could slow increases. The House Ways & Means Committee has passed its own, dramatically reworked version of SB 1. That legislation, which has yet to hit the House floor, would set the trigger for property tax elections at 6 percent. And those carrying that legislation have offered a different message than their Senate counterparts. In an interview Tuesday, Bettencourt said he could “state with absolute mathematical certainty” that his bill — and forcing elections on revenue increases — would slow the growth of property tax bills throughout the state. He called for the House to pass some version of it that would kick off deliberation between the chambers in earnest. The full House has already approved separate legislation, House Bill 32, that would overhaul appraisals. It has also advanced a range of narrower proposals, including some aiming to yield savings for certain groups of Texans such as disabled first responders. This piecemeal approach could force the Senate to consider a wide range of property tax proposals with little time to do so. While Abbott has not said what outcome might prompt him to call lawmakers back for a second special session, several lawmakers pointed to the failure of property tax reform as a likely suspect. “I think we need to do what’s right for Texans," Simmons said. "And if property taxes is really important, which I think it is, then we need to get to an answer on that." Kirby Wilson, Andy Duehren Brandon Formby and Alexa Ura contributed reporting to this story.